Here’s a timeless question: Readers Kate and Tom ask how to approach a Retro Renovation of their 1960s kitchen — which was updated by previous owners in another decade’s style — but, with an eye toward being thrifty and toward resale some day. What is your advice? Note: I’ll let readers comment for a while, then, I will follow up with my thoughts and what I learn from you! Update: My followup story with my ideas is here. This truly is a great resource! I’m pondering ways to re-vintage our 1960s house, which we bought a couple years ago from a couple who had done painstaking renovations of their own (not the original owners) in the 1990s. The house has their flesh-toned fingerprints all over it, and he was a master woodworker, so it’s a very professional 1990s vibe that we have to contend. We have both lived in older homes that looked more true to their era, and we long for that midcentury look which seems to match the house’s soul. Here is a photo of the kitchen. We just added paint color but dislike hardware, granite, backsplash. What are your thoughts? How can we accentuate more of that 1960s vibe in a way that won’t detract from potential resale value? How should Kate and Tom approach a Retro Renovation — also with an eye toward resale and unnecessary expenditures? If you truly don’t like your granite counters and you plan to be there for more than 5 years, I would look at having them gently removed and stored in your basement or garage or crawl space and putting in the counter you want. Wilsonart has some great new linen look laminates in gorgeous colors, we are about to install their Cucumber Juice color in our 1957 house. A future owner can always have the granite reinstalled if they want it and you will have the kitchen you want now. I’ve lived in many old houses where previous owners have made changes but kept the originals on the property (pocket doors, trim pieces, pass-throughs, light fixtures, medicine cabinets, even hardware) I’m always grateful to have the option of reinstalling. You never know what a future buyer would really want (I’d take the laminate over granite in a vintage house any day) In fact, when we were looking at the house we own now, our realtor apologized for the original pink bathroom (which we LOVE) and showed off the second remodeled bathroom (which we HATED, ripped out and redid as a vintage blue bathroom). You never know what future owners will want or what will be in style in a few years. You could also wallpaper your soffit with a vintage pattern, change your hardware out, add vintage look lighting and a round rug. 4×4 tiles installed in a grid rather than a brick pattern make a perfect vintage backsplash and are not too expensive. We have also found many color 4x4s at ReStore for low money, but you have to keep visiting until you find the right ones. Add vintage counter accessories you like (old canister sets come in many styles and give a lot of bang for the buck). Remember, in the end, it’s your house, you should having the pleasure of making it look like what you want to live in. I would get rid of the granite!! We live in a 1963 built home. We have white tile countertops which i love. I know that granite is the current rage but not for a 60s home. Rugs and paint and retro cabinet and drawer pulls. Granite is definitely not 60s deco. We live in a 1963 home. We have white tile countertops which I love!! Paint, rugs and retro drawer and cabinet pulls would be good. Wish I could send a picture of our Kitchen. I’d put in tile countertops, 4″ square tiles, in a pastel color. Electric cooktops were popular, as were wall ovens. We purchased a nice 1960 house in a desirable neighborhood that needed basics-like windows (all broken), heat, pipes, insulation, doors… Not to mention asbestos tile under dirty white carpet and an awful 90’s kitchen (whitewashed maple (think pink) cabinet doors with red handles on melamine cabinets). Having grown up in nice 1200 sq ft post WWII houses in “silicon” (Santa Clara) valley we appreciate the good form and function of that era. But if Corian had been available rather than Formica, be sure our parents would have put it in. So we replaced what had to be to make the house inhabitable and are trying to keep the 60’s look with accents and buying art and furniture from thrift stores. I agree with removing and saving the granite (it is not food-safe). Put in a solid surface that makes sense to you, and do the 4.25 inch tile backsplash. Replace cabinet doors with plank style. If the floor is floating, replace with something era-appropriate looking – and water resistant. 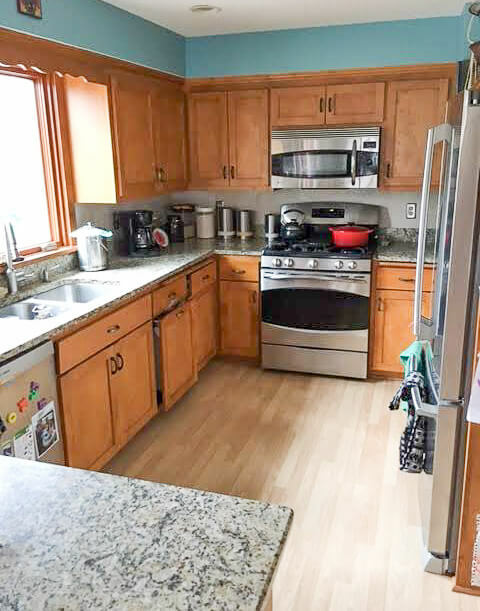 My mom chose a neutral beige-pinkish speckled tile for her countertop with coordinating but contrasting full height backsplash in 1956, so bright colors are not necessary to be era-correct. I picked a Corian for my counters that is almost the same colors. Again, it has to make sense for your lifestyle. We’ve waited 6 years to do master shower (had to demo yellow speckled tile because all the plumbing (on slab) was corroded through) but found tile guy who floated walls the old way and used quarter round correctly. Again, had to meet current code (can’t use the chrome soap holders with the little handles anymore in CA) but went with matte white and chrome. My best advise: go slow and weigh each expenditure; save for retirement. I am not an expert on whether granite is food-safe or not: Readers, do you own research…consult with pros.